Margaret McIntosh and Rio Rio at the 2014 USEF Para-Equestrian Dressage National Championships. Photo courtesy SusanJStickle.com. Jupiter, FL – March 28, 2015 – Horse Radio Network’s once-a-month Para-Equestrian Show featured Gigi (Margaret) McIntosh, Jane Cory, and Missy Ransehousen with hosts Lindsay McCall from the United States Para-Equestrian Association (USPEA) and co-host Ellie Brimmer. To listen to episode #304, please visit: http://www.horseradionetwork.com/2015/03/26/dressage-radio-episode-304-by-uspea-gigi-mcintosh-on-her-comeback/. About Gigi McIntosh: Margaret McIntosh broke her neck in the spring of 1999 while riding in an event, resulting in incomplete quadriplegia. Initially paralyzed from the chest down, she is eternally grateful for having the opportunity to regain her mobility. McIntosh had extensive riding experience before her accident: 1970-1976 Working student for May and Denny Emerson; 1976-1979 Working student and barn manager for Gunnar Ostergaard and Ellin Dixon; 1979-1983 Working student/groom George Theodorescu in Sassenberg, W. Germany; from 1987 through 1999 Gigi evented several horses with lots of help from Bruce Davidson, culminating in completing the CCI*** and CCI**** at Rolex Kentucky 3-Day in 1997 and 1998. Six months after her accident she began riding with Jane Cory, the owner of the Cort Center for Therapeutic Riding at Pleasant Hollow Farm in Pleasant Valley, PA.
She initially asked Missy and Jessica Ransehousen for help just before the World Equestrian Games in 2010 and has enjoyed their expertise ever since. In 2012, McIntosh qualified for the London 2012 selection trials including successful trips at back-to-back CPEDI***s in Wellington, FL. McIntosh was also the Reserve Champion at the 2014 USEF Para-Equestrian Dressage National Championships. Married since 1983, with two grown children (Charlotte (27) and Cameron (25)), and her husband, Brian, a retired banker. McIntosh is now aiming at the 2016 Paralympics in Rio de Janeiro with her own Rio Rio. About Jane Cory: Jane Cory of Coopersburg, Penn. owned and managed the notable Pleasant Hollow Farms from 1970 through closing its doors in 2007. Pleasant Hollow Farms in Coopersburg, Penn. was known in the equestrian world as the host of many prestigious dressage and combined training events including 20 competitions per year. In 1980 Cory began the Cort Center for Handicapped Riding, Inc. and was the Executive Director there. In addition to her farm and the Cort Center for Handicapped Riding, Cory was the full time instructor at Delaware Valley College from 1996 to 2004. Cory continues to be very active teaching both dressage and eventing lessons, managing Jersey Fresh International, as well as two USEA/USEF recognized horse trials held at the Horse Park of New Jersey. She also manages 2 USEF/USDF dressage shows held at the Horse Park of New Jersey and is an “r” eventing judge. About Missy Ransehousen: Ransehousen has been involved in the equestrian world since she was a child. Growing up with an Olympic Dressage rider as a mom she knew the dedication it took to get to the top. Ransehousen was a talented Young Rider bringing home the Gold Medal in 1988. Her love for the sport would lead her to multiple wins as an Eventer. Highlights in Ransehousen’s career include representing the U.S. on the 1995 Pan American Games Team and riding at the Rolex Kentucky Three-Day Event. In 1998 Ransehousen began working in the Para-Dressage discipline leading her to be selected as the 2000 Sydney Paralympics U.S. Team Coach. 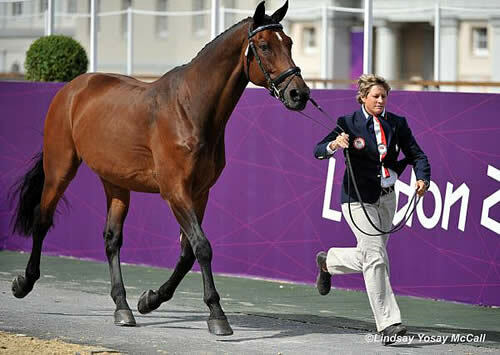 Since 2000, Ransehousen served as Chef d’Equipe over four consecutive Paralympics and the 2010 World Equestrian Games. Ransehousen is located out of Blue Hill Farm in Unionville, Pennsylvania. Photo provided by Blue Hill Farm. Ocala, Florida – February 25, 2015 – Eventer, trainer, and past U.S. Chef d’Equipe of the Paralympic Equestrian Team Missy Ransehousen lost her camper and car in a fire on February 23 in Ocala, Florida. Ransehousen lost her living quarters and her Subaru Outback in the blaze in addition to her riding and show clothes and equestrian memorabilia. The cause of the fire has not been confirmed at this time, and Missy is currently working with the fire marshal and her insurance company to determine how much of the loss will be covered. Rebecca Hart and Schroeters Romani. Photos by Lindsay McCall. Unionville, PA – November 18, 2014 – Competing at an international level requires much more than just being a good rider; it takes a village. For para-dressage rider Becca Hart, three of the prominent members of that ‘village’ are Jessica and Missy Ransehousen and Todd Flettrich. The support and tutelage of the three trainers has helped propel Hart to where she is today: riding down centerline at the highest levels of para-dressage competition, including two Paralympics and two World Equestrian Games (WEG). At that time, the training relationship that had begun to develop in 2006 between Hart and the Ransehousens continued to flourish into one that would truly help springboard Hart’s career. In Missy, Hart has a trainer well versed in teaching para-riders and in helping them compete at the highest level of the sport. The combination of Missy and Jessica’s generosity and coaching and Hart’s talent was becoming a force to be reckoned with in the para-dressage ring, but as the 2010 World Equestrian Games approached, Missy too was competing and with conflicts in coaching Hart in Florida, she felt it was time to bring in an added reinforcement. Missy knew that longtime friend and professional international dressage rider Todd Flettrich would be just the man for the job. Jessica saw the passion that Flettrich had for the sport and offered to have him train with her at Blue Hill Farm, much like the current day situation between Hart and the Ransehousens. “I recently went with [Hart] to a nice schooling show at Dunmovin where she rode really well and got a nice 67 percent in her third level test,” Jessica said. For more information about the Ransehousen family and their Blue Hill Farm, click here. To learn more about Becca Hart visit, http://www.teamusa.org/para-equestrian/athletes/Rebecca-Hart. Lexington, KY – The United States Equestrian Federation (USEF) has nominated Capt. Mark Phillips and Missy Ransehousen for top coaching honors with the United States Olympic Committee (USOC). With this nomination, they have been named USEF Coach and Para-Equestrian Coach of the Year. Capt. Phillips has had a long tenure of medal winning service to the USEF. Beginning in 1993, he has brought medals home from every championship he has coached, except for one. In 2011 his team made history. They won Pan American Team Gold with all five athletes finishing on their dressage scores. This is the first time in history this ever happened. The U.S. Team also won Individual Silver and Bronze. Even more impressively, this was a relatively inexperienced team, only one rider had represented their country previously. He has worked tirelessly on the developing rider program the results of which are now being utilized. He serves on four USEF Committees and is a top international course designer and technical delegate. His impact on the sport, both in 2011 and throughout his career has been profound and garnered him the Nomination of USEF Coach of the Year.